Perfect weather for a game of chess on one of the tables on the grass outside the cafe on Sunday. I had the White pieces and played the same first few moves as my last game with White against Dane, but in a different order, not setting up the defence on the King side straight away. I think I could have done better on move 15. I took the Black Knight with my Bishop (which was then taken by Black's Bishop), as I was apprehensive about the Knight coming back near where my Rook was about to attack. 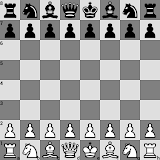 It should have been better to keep the Bishop in play - it had a strong line of attack by moving to e5 after the pawn had been taken by the Rook (if the Black Knight took my pawn on d3, then covering e5 before my Bishop got there, my Rook could get Black in check and a Queen sacrifice would be the only way out of it, or, if the Black Knight moved to a6 after the Rook took the pawn, it would be able to block the Rook's check by going to b8, but then the White Bishop move to e5 would cause some trouble for Black...). Can't complain, though - I got a win out of the game.